Hosting a big decision and I don’t take recommending a host lightly. There is no shortage of BIASED hosting reviews on the internet because hosting companies pay out commissions for any referrals a reviewer sends to them. 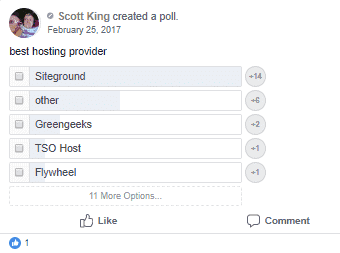 In this Siteground hosting review, I’ve tried my best to include as many UNBIASED opinions as possible. The best ones I’ve found are in the form of advice given from one site owner to another on social media. Below you’ll find lots of social media posts for your reference and further reading before you make your hosting decision. This post is also a beast (over 5,000 words) because I didn’t want to leave any stones unturned. The first few paragraphs explain why I decided to move all my sites to SiteGround. I’ve used many hosts over the years. I built my first website on HostGator back in 2008. When I started building lots of websites (20+ per month) I moved my operations to BlueHost. When clients wanted me to host their sites I did so using an InMotion reseller account. 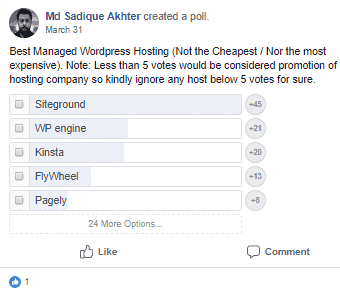 When the hosting budget for my own sites wasn’t an issue I moved my sites to WPEngine because I thought they were the best. And they are great, but they’re also expensive. Now I’m on Siteground and they are the best, but don’t just take my word for it. See what others have to say. 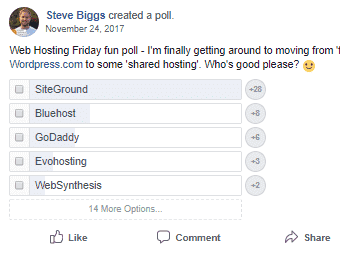 Siteground is consistently the #1 recommended host in Facebook groups and polls. 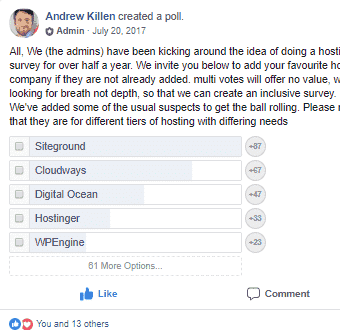 The WPHosting FB group (private group) has run the same poll for three years and Siteground is number 1 in 2016, in 2017 and in 2018. They’re also ranked #1 in this Facebook poll and in this one. I can go on all day. 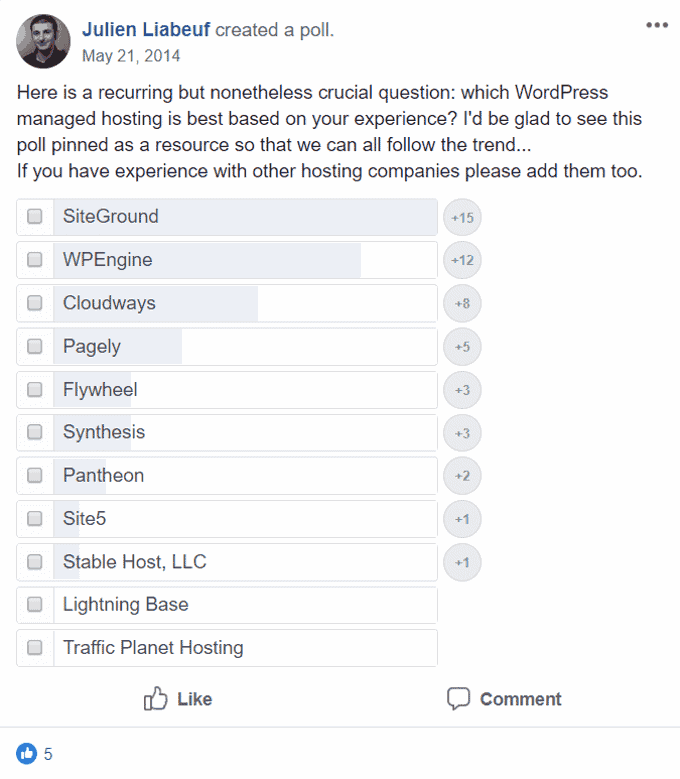 Even in the WPLearningLab Facebook Group (join here if you’re not part of yet), Siteground is consistently recommended when someone asks about better hosts. Siteground is the only host I actively promote and it’s the only host I currently use. 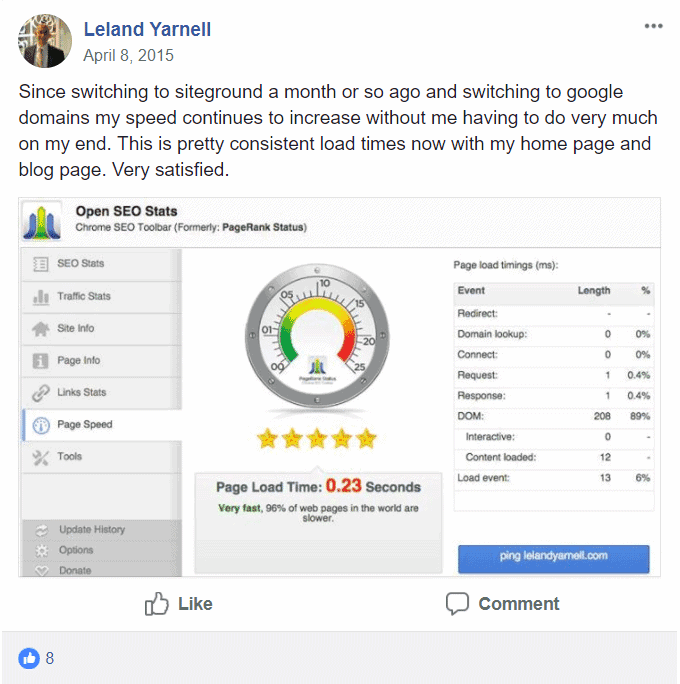 They have amazing support and speed technology that helped get my site to load in under 1 second, which is the holy grail of site load speed. You can find lots of reason to switch when you see their StartUp vs. GrowBig vs. GoGeek comparison chart and they’ll even migrate your site for free (with zero downtime). And like any respectable company, they have a 30-day money back guarantee. Between their amazing support and speed technology that got my site loading in 1 second in Pingdom and 1.5s in GTmetrix, plus tons of features you can see on their StartUp vs. GrowBig vs. GoGeek comparison chart (and the fact they’ll migrate you for free with 0 downtime and have a 30-day money back guarantee) – there is literally no reason not to try them out. They’re also the only host listed on all 3 WordPress, Joomla, and Drupal recommended hosting pages. Between this site and the WPLearningLab YouTube channel nearly a half-a-million people read/view my content every month. So I have to make sure when I recommend a host (and use a host) that they are the best. 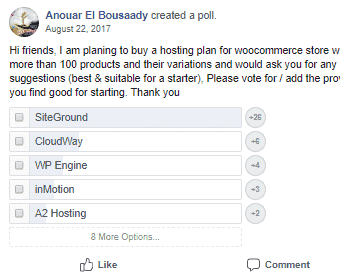 I believe that Siteground is the best. But I may be biased…and they offer me a commission for every person I refer through affiliate links on this site. It doesn’t cost you more to buy through my affiliate link but the commission they send my way does keep the lights on, feed the kids and allow me to keep creating awesome WordPress content! Down below, you’re going to find a metric ton of unbiased social media posts and recommendations for Siteground. Leave a comment if you have questions or concerns! Affiliate Disclaimer – you can assume that all links to Siteground on this page (and on this website) are affiliate links. If you purchase a hosting package after clicking one of those links, Sitegorund will send me a commission. It doesn’t cost more to you, but it helps keep the lights on over here. If you don’t want to use my affiliate link, here’s a non-affiliate link. 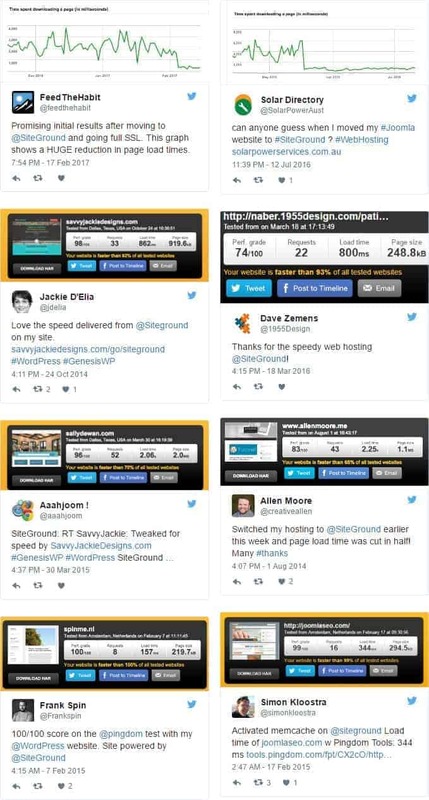 No matter which link you buy through I believe 100% that you’ll love Siteground for their speed and great support. Because these are the most unbiased reviews you’ll find. This is just WordPress users sharing their opinions with no reward of any kind. 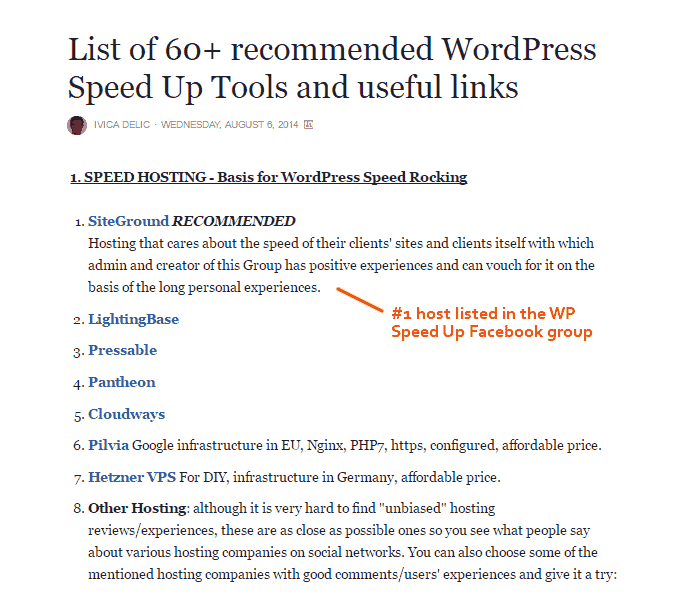 Ivica who runs the WordPress Speed Up Facebook Group and ranks them #1 on his resources page. 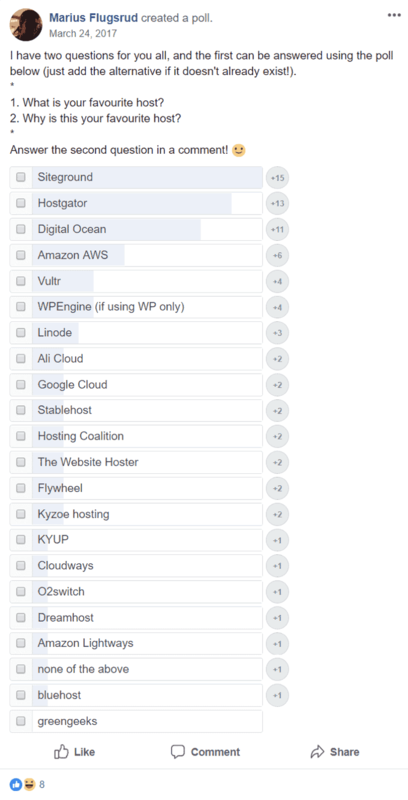 There are at least 25 reasons why I use Siteground hosting. With many hosts, the time to first byte (TTFB) is a serious problem. The hosts I’m referring to are EIG hosts and GoDaddy. The reason is that they overload their shared servers with too many users which slows things down for everyone. Even though I’m using the Siteground shared hosting, the server response time is much faster than WPEngine. The time to frist byte would have been under 200ms ff it wasn’t for the SSL certificate, which takes a while to load no matter where your site is hosted. 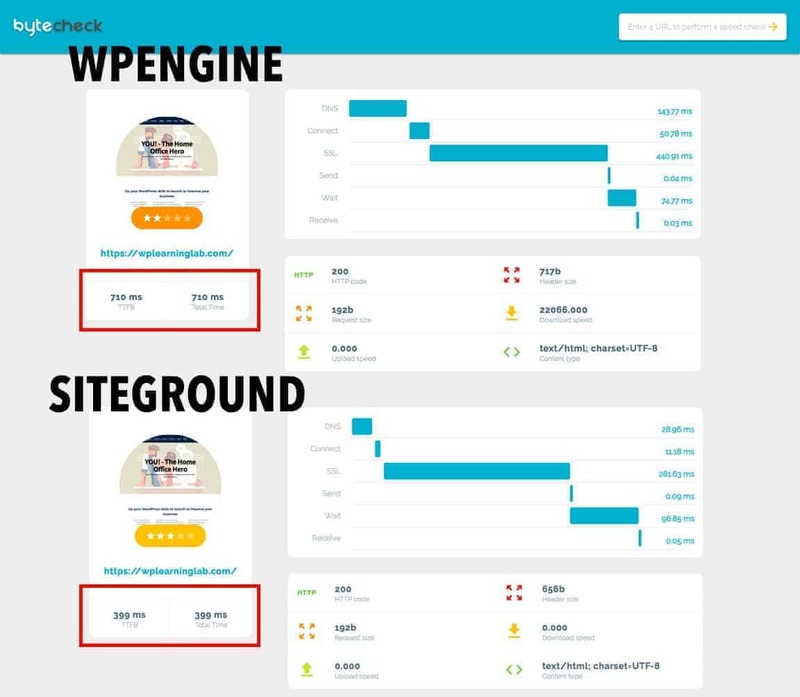 If you weigh that against the much higher cost at WPEngine, SiteGround is a smoking deal. I know what you’re thinking, a host isn’t the only thing that affects site load time. And you’re right, there are oodles of factors. But consider this, no matter how well you optimize your site, if your host is slow, your site is slow. Having a fast host on your team is key to fast page speed. 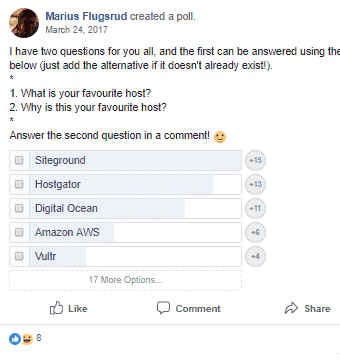 Your next question is probably, what makes Siteground so fast? Well, it’s not magic, it comes down to investment in solid infrastructure. 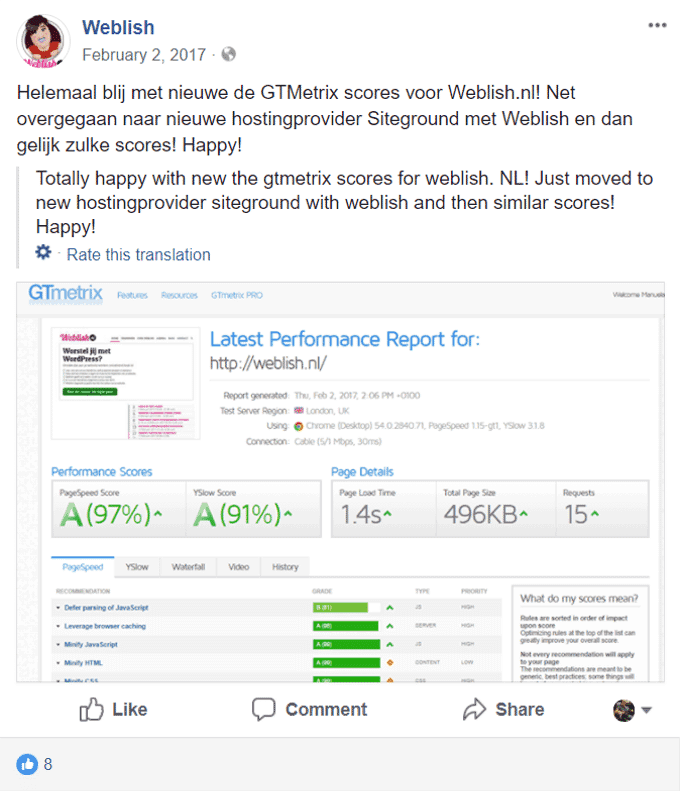 When other hosting companies (look up any EIG host) are cutting costs and destroying user experience, Siteground is investing for the future. 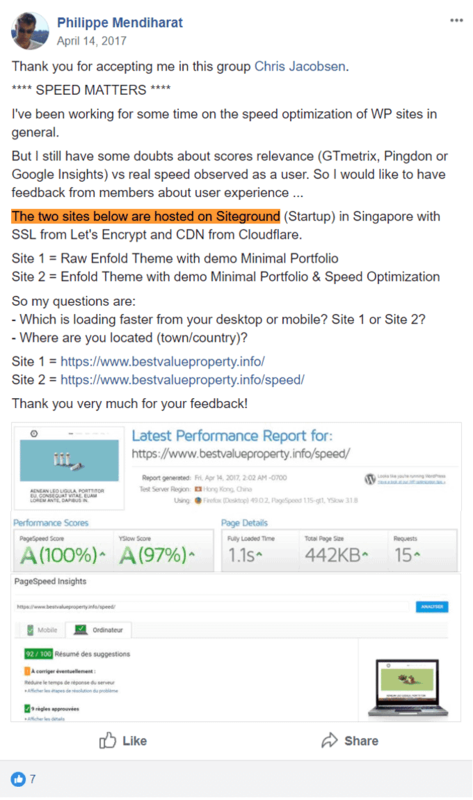 Here’s what the Siteground Speed Technology includes. The best and most recent example of this is PHP7. When PHP7 first came out Siteground was at the forefront of making it available to its clients. Now most hosts have the latest PHP version available, but it took a lot longer for them to get it. Why does that matter? Speed and security. 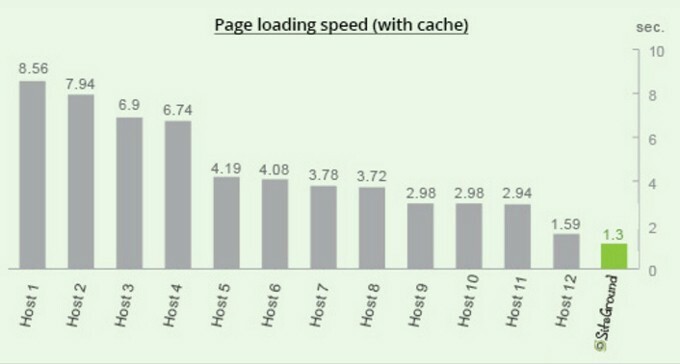 As the PHP version increases, so does the number of requests per second your site can handle. In other words, the faster your site will be, especially in high traffic situations. HHVM, is even faster than PHP7. Siteground also offers HHVM, but only for cloud hosting clients. If you want to find out what PHP version your site is using, simply install this plugin. You will see the PHP version on the main admin dashboard (see screenshot below). You can delete the plugin right after. Here’s the best part, SG Optimizer plugin does the PHP version updates for you. First, it checks to make sure your themes and plugins are compatible with the latest version. If they are, it updates the PHP version. Normally, updating the PHP version requires manual steps, that’s why few people do it. 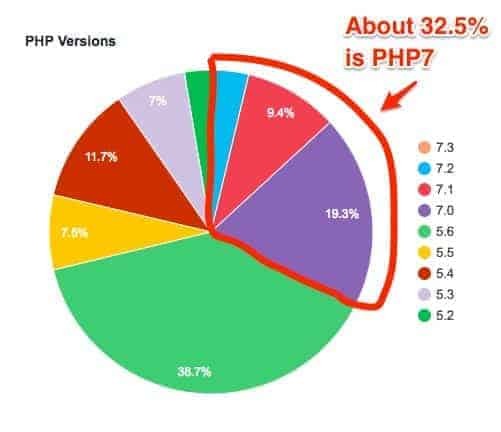 Even though PHP7 was released in 2015, still only 32.5% WordPress websites use it. This chart is right from WordPress. These two mechanisms work together to cache your website (static, dynamic, memcache), purge dynamic cache whenever content is updated, configure HTTPS to force SSL (if applicable), and make sure you’re running the latest PHP versions. Since Siteground caches your site, do you need other caching plugins? The answer is probably. Here’s a quote from the Siteground documentation. “…most caching plugins include other functions that your website can benefit from. The point here is to make sure that if you need to use more than one caching systems concurrently working on your website – they will not be all doing the same thing. For example, our SG Optimizer will store cache for your website directly in the server’s memory. In comparison, other WordPress caching plugins will use a file-based caching method storing the gathered cache in a separate directory inside your application. Siteground optimizer is great for caching, but “Caching plugins” like WPRocket, W3 Total Cache or WPSuperCache help you with many other things. Getting a perfect score in Pingdom or GTMetrix will take the help of one of those plugins. Here’s an SG Optimize tutorial in case you want to know more about it. Enabling Cloudflare is super simple using Siteground’s 1-click process. They have a full tutorial here. Cloudflare Plus is an option for everyone who wants an extra dose of awesome and the $12/month price tag is within budget. In case you haven’t heard of Cloudflare, it has a lot of great features. The one that Siteground takes advantage of the CDN (content delivery network). On a website without a CDN all the images and media resources are loaded from your server when someone visits your site. This takes your server bandwidth and CPU. If you activate the Cloudflare CDN your media resources will be loaded by one of Cloudflare’s 152 datacenters around the world. When a visitor requests media on your site it will be shown to them by the datacenter closest to the geographical location, which helps with faster loading. It also doesn’t use any bandwidth or CPU on your server, so your site can remain lightning quick. WordPress recommends using a CDN in their optimization guide and Siteground makes it very easy. The main difference between the plans is the number of websites you can host and server resources. With the Siteground Startup hosting plan you can have one website. But even if you ever have just one website you’ll need to upgrade to a bigger plan if you starting getter more than 10,000 visits per month. The GrowBig hosting plan offers more server resources which means faster load times and the ability to handle more traffic without reduced user experience. See a full comparison of all the Siteground hosting plans. As it should be, the bigger (more expensive) the hosting plan the better your site performance will be. StartUp. This is their entry-level plan. With it you can host 1 website with less than 10,000 visitors per month. It’s better than many hosting plans out there for a similar price ($3.95 per month), but because it’s an entry-level plan it doesn’t have the same level of speed, storage, support priority and lacks some other great features. A daily backup is included as well as 99.99% uptime guarantee. The big downside is that it lacks server resources. GrowBig. This plan allows you to unlimited websites, but has limited resources so technically you can’t host that many sites. For example, if you have one site that has 25,000 visitors a month then you can only host one on this plan because that’s the upper limit. It does have twice the server resources compared to the StartUp plan as well as priority support, 20 daily backups, backup restoration tool, advanced caching and site staging capabilities. 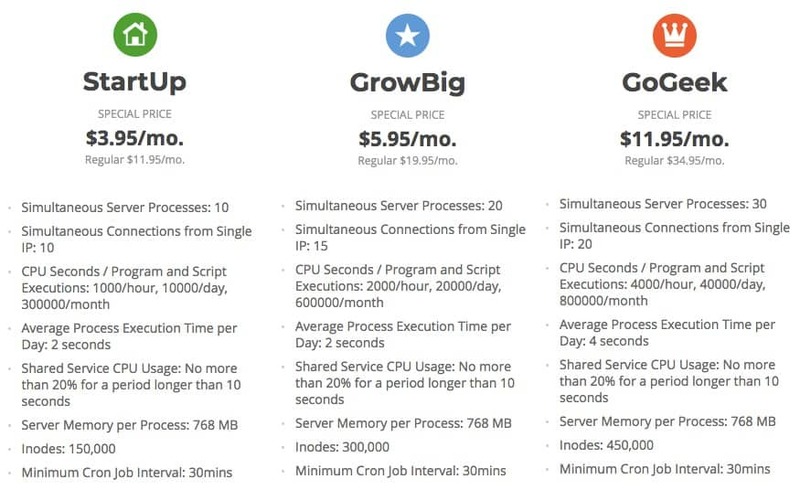 The GrowBig plan has the best cost to server specs ratio. Best cost/value ratio. This is considered semi-dedicated hosting and is about 4x faster than the StartUp hosting plans. It’s perfect for any who wants a super faster website (who doesn’t), but doesn’t want to jump up to cloud hosting. But as your traffic goes up to ~100,000 you’ll have to upgrade to a Cloud Plan anyway. Some great features that come with this plan are 30 daily backups, unlimited website restores done by SiteGround’s support team, a staging site for testing, eCommerce features including a free Wildcard SSL for 1 year and a PCI compliant server for credit card fraud protection. Perfect for people who want a super fast website but don’t want to pay $80/month for cloud hosting. Includes staging (for testing before launching), unlimited restores by SiteGround’s support team, and e-Commerce features like 1 year free Wildcard SSL and PCI compliance for credit card fraud protection. If you are looking to move a larger site with lots of traffic to Siteground then the Cloud hosting plans may be what you need. Especially if you’re getting more than 100,000 visits per month, since that’s the limit of the shared plans. The big benefit of Siteground Cloud Hosting is the ability to use resources as needed. With the entrylevel cloud hosting plan (it’s actually called Entry) you will 2 CPU cores and 4GB of RAM. That doesn’t mean you’ll use all those resources all the time. But if traffic spikes on your site those resources are always available, which means your site won’t go down when you need it up the most (ie. during traffic spikes). Compare all the Cloud hosting options here. 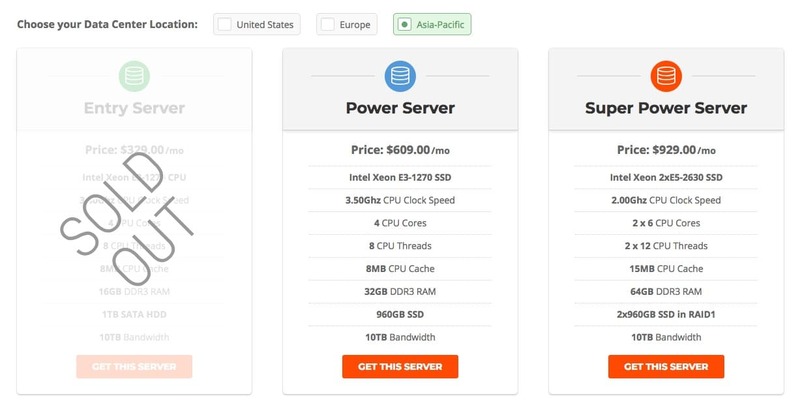 There are 4 levels of Cloud hosting all the way up to 8 CPU cores and 10GB of RAM for $240 per month. All Cloud hosting plans included Isolated Resources. It means your site is located on unlimited servers in the cloud, not just one server as in the regular plans. So your site is unaffected by other sites in the cloud. On the shared hosting plans your site will be affected if someone on your shared server is using too many of the server resources. Cloud hosting also comes with HHVM which is even faster than PHP7 (learn more about HHVM here) and it can be activated in SiteGround’s cPanel when using their Supercacher tool. If you need more resources than the cloud can offer, you can move to a dedicated server. Although no one wants to pay out the wazoo for dedicated servers, everyone who has a website should have the goal of getting so much traffic that you need a dedicated server. If you’re not building a site to get traffic, then what are you building it for? Dedicated servers are the highest end of Siteground’s host offering. They start at $229 per month and go up to $729 per month. You can see the specs below. If your site is getting 10,000 visitors a day or more you should be shopping around for dedicated servers. The Enterprise Server recently went up in price by $300 per month. I don’t know for sure, but anyone who got in at a lower price point may have been grandfathered in a lower price. If the price continues to increase then getting in early may be a good thing. When getting dedicated servers you also have the option of choosing your location. Currently, you can choose from the United States, Europe and Asia. The servers in Asia are more expensive add the Entry Server plan is sold out (see below). 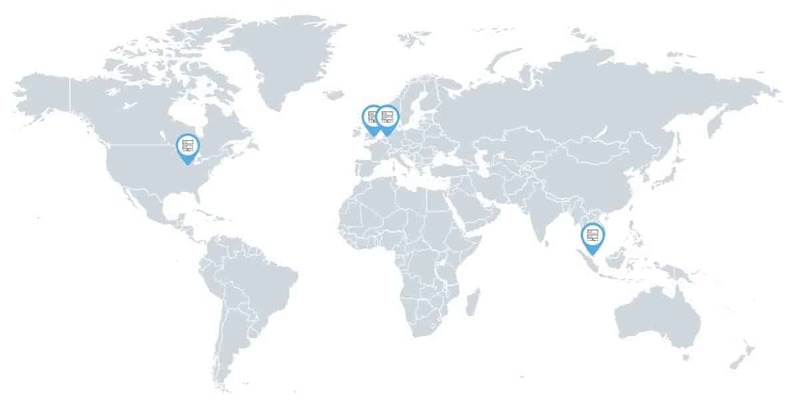 At the time of this writing, Siteground has 5 data centers in the United States, Europe and Asia: Chicago, London, Amsterdam and Singapore. When you sign up for a Siteground hosting package you can choose to have your site live in the data center closest to your location or closest to your client’s location or closest to your target audience’s location. The best choice is the one closest to your visitors, but I know how some clients are. They may only care about the one closest to them. Siteground’s data centers have redundant storage, so your sites should stay online even if there are problems in the data center. Bluehost doesn’t have this technology and they had a big problem when there was a network outage. Hostgator had a similar issue years ago when there was fire near their headquaters and the fire department told them to shut down their servers. I had my sites hosted with them at the time. 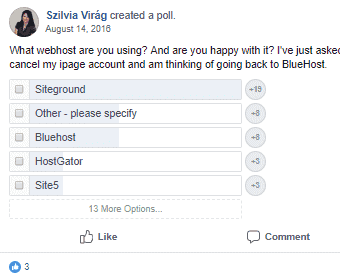 Both Bluehost and Hostgator have problem moved to better technologies. But wouldn’t it be better if your host took proactive steps to make sure this doesn’t happen? 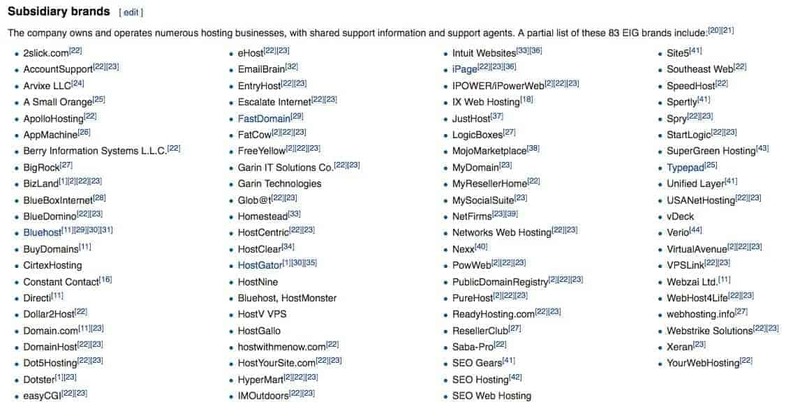 Also, both Bluehost and Hostgator are owned by EIG, so steer clear of them. When things go wrong and you don’t know what to do, having a great support network is critical. That’s true for life in general, not just websites. I don’t know what Siteground support can do to help you through major life events, but they can do nearly anything to help you fix your site. 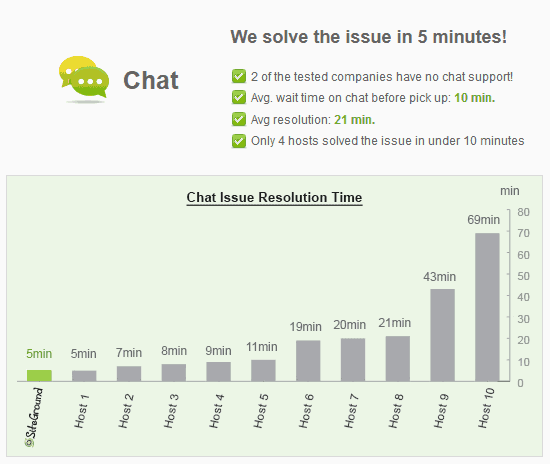 Whenever I email support through a StartUp account I have they respond within less than 15 minutes. 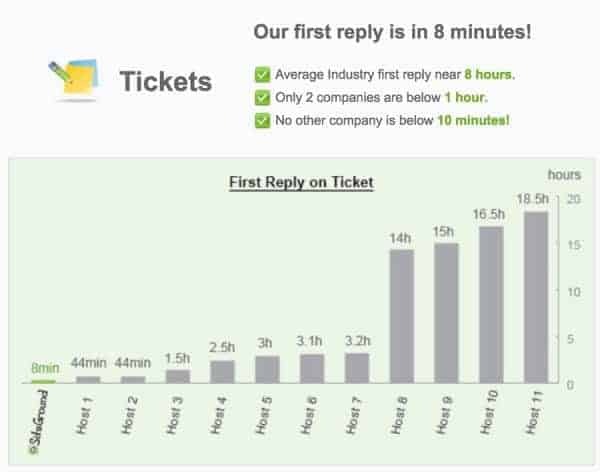 It’s even faster with GrowBig and GoGeek because they have priority support tickets. On GrowBig and GoGeek, they’ll even migrate your site for free if it’s hosted somewhere else. To keep all accounts isolated, Siteground uses Linux containers. This prevents problems on other sites on your server from spilling over into your account and your sites. They also provide Linux containers like pretty every other host does. Here’s where Siteground sets itself apart again: they are proactive. The only other host I’ve seen this level of proactivity from is WPEngine. A few years ago the httpoxy vulnerability was making a comeback, leaving many hosts open to being hacked, but Siteground patched it nearly half a decade before it was a major problem. Here’s their blog post. Siteground guarantees uptime of 99.99%, but so far I’ve found it’s close to 100% (as if 99.99% isn’t close enough). I use WebARX to monitor uptime (and block malicious attacks). This screenshot shows the last 7 days of 100% uptime for this website. I’ve WebARX data from other sites when I didn’t have them on Siteground and their uptime was not 100% and wasn’t even at the 99.99% level they promote. 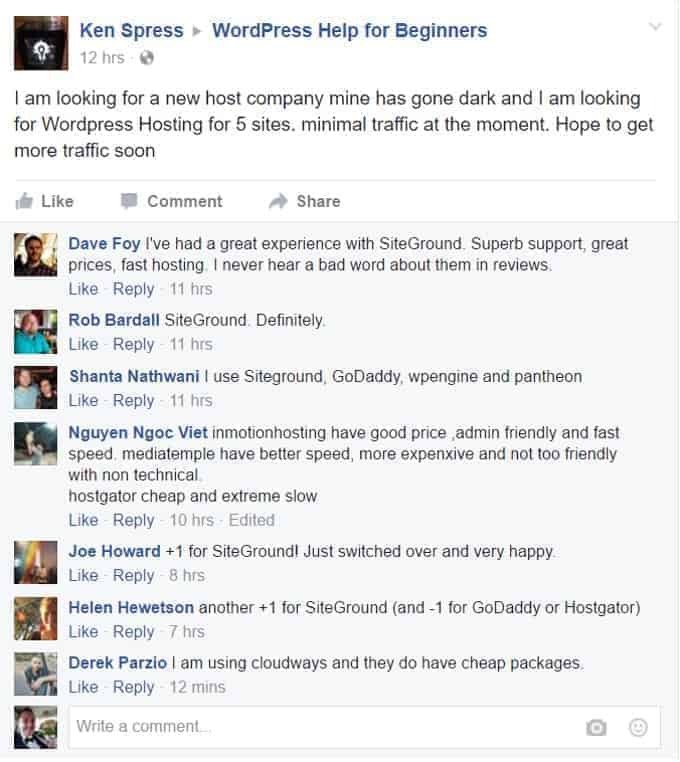 Here’s a little screenshot from Siteground’s Facebook page. It shows just how proactive they are in security and uptime. 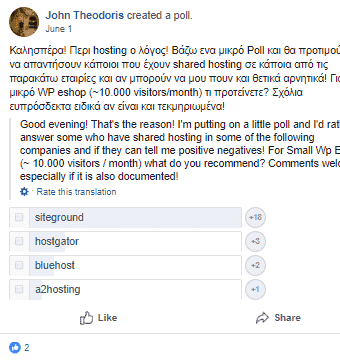 The last comment is by Ivica from The WordPress Hosting Facebook group. This is a feature that a lot of people like, but I’m not a big fan. I’ve been using WordPress long enough to remember the “old days” where updates broke sometimes websites. It’s less common now because WordPress will stop an update that generates a fatal error, but it’s not guaranteed. Either way, inside your Siteground cPanel you have the option of setting automatic updates for major WordPress releases and minor releases. You can set it to delay the update up to 72 hours after the release if you wish. You can also allow plugins to be updated along with the core releases. The big one on this list, in my opinion, is the free PCI compliance in the GoGeek package. With people (and law makers) becoming more and more fed up with the lax approach to privacy online, there are going to be some major changes coming soon. And if you accepting credit card payments on your site then you need to be PCI compliant (Payment Card Industry Data Security Standard). PCI compliance prevents credit card fraud by passing all purchase through various filters and requiring each payment to meet 12 requirements. The Free Let’s Encrypt SSL is something that every host is offering now that Google has pretty made it required (see what I mean in my YouTube video here). A shopping cart is essential for an eCommerce site and Siteground helping you install it for free is an added bonus. They support all the shopping carts listed on this page (which is all the major ones). You may also find their merchant account solutions info page useful. The majority of hosts out there have a something called cPanel, short for contrl panel. It is where you manage your hosting account. They all look a little different but work the same. You can check the Siteground cPanel demo here. While you’re in there can you can check out all the features I’ve talked about in this post and more. Make sure you take a look at the 1-click Cloudflare integration, staging sites, backups, supercacher, sg-git, autoupdate and much more. To get a free transfer you need to get a GrowBig or GoGeek plan. The StartUp plan does not include a free transfer, but you can pay for one if you want. Or you can watch one of my two migration tutorials on YouTube and get the job done yourself this afternoon (tutorial 1, tutorial 2). If you want to take advantage of the free transfer here’s a Siteground help page to get you going in the right direction. 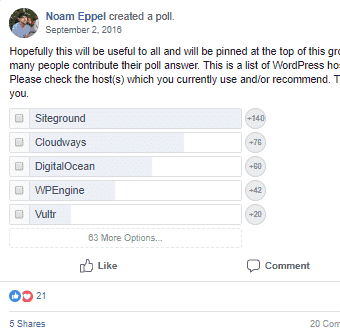 Siteground is one of the few hosting companies recommended by WordPress itself; you can see the short list here. 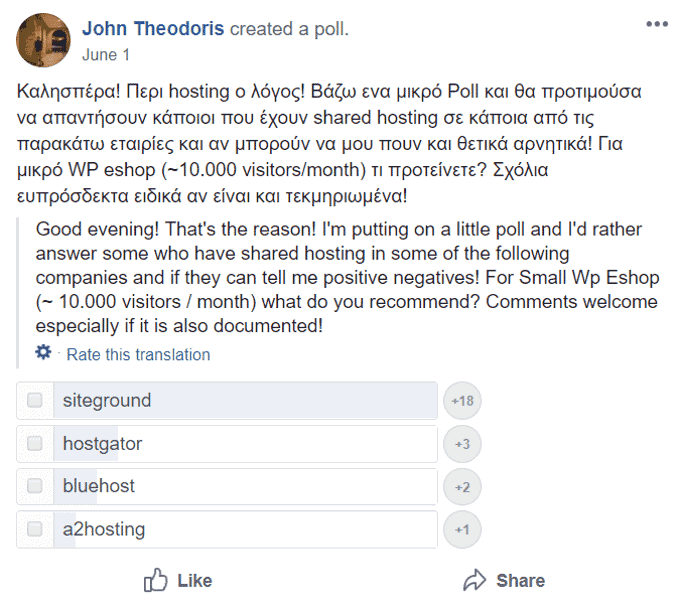 Unfortunately, they also recommend Bluehost which is an EIG company, so the WordPress recommendations should be taken with a grain of salt. 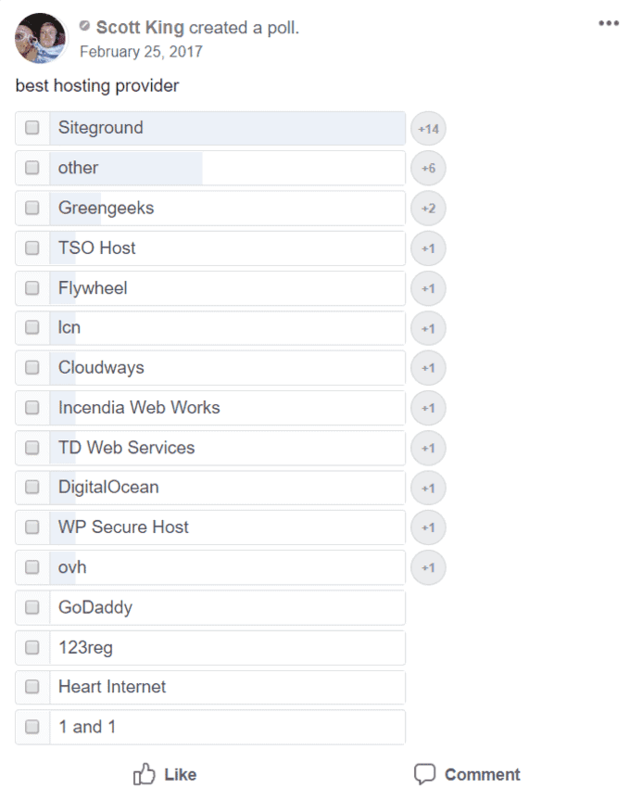 Just for fun, Drupal, also recommends Siteground as a hosting provider, but they recommend lots of others as well. Just for more fun, Joomla, used to recommend Siteground, but don’t any more. They also have Sitelock listed as a recommended partner. EIG owns part of Sitelock and a boat-load of people have had very bad experiences with Sitelock, including me. Check out this YouTube video and pay special attention to the comments. If you’re new to website hosting you probably haven’t heard of EIG. They are multinational conglomerate that buys hosting companies. Then, to squeeze as much profit as possible out of them, they immediately cut support staff and put more accounts on the same servers. This equals a bad experience. What makes it even worse is they start pushing Sitelock on their customers. Siteground is NOT AN EIG company. And no matter which host you choose, make sure they’re not EIG. It might sound like I have a bone to pick, but I don’t. I just know they DO NOT treat their customers well and my job is to guide you in the right direction to make sure you have the most success possible with your website(s). To check the server response time of your current site (if you have one) go to http://www.bytecheck.com/ and type in your URL then click the yellow arrow. This will show you the Time To First Byte (TTFB). The host packages cost the same, but clearly they are not built the same! 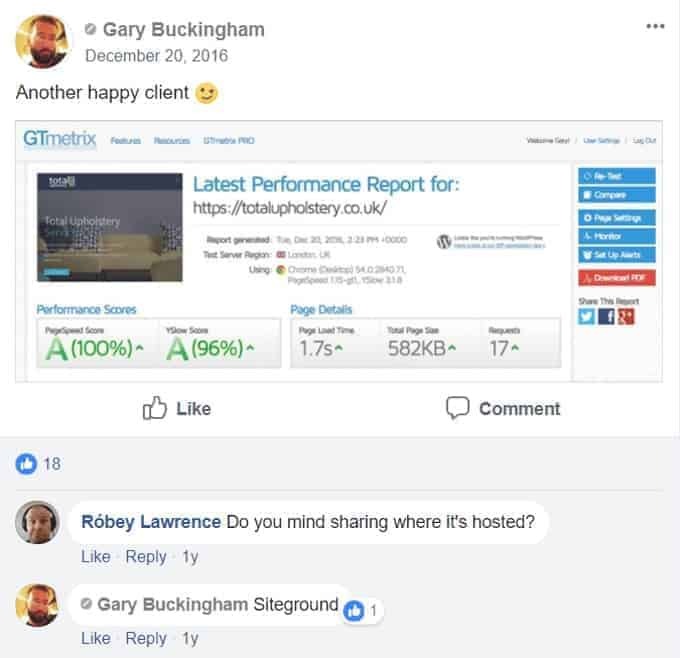 If you are on the fence about getting a Siteground account make sure you read through these conversations. If you do, you’ll start to see a pattern and your hosting decision becomes a no-brainer. Some of these posts are in private groups, so to see them you’ll need get into the group (it’s free). I’ve also included some of the below as images. Any feedback on using siteground.com? 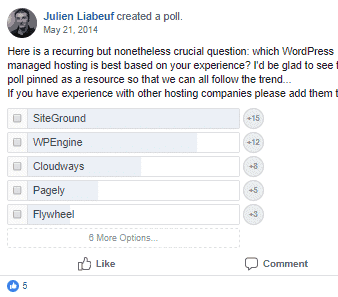 Any feedback on hosting with siteground – a WordPress site? 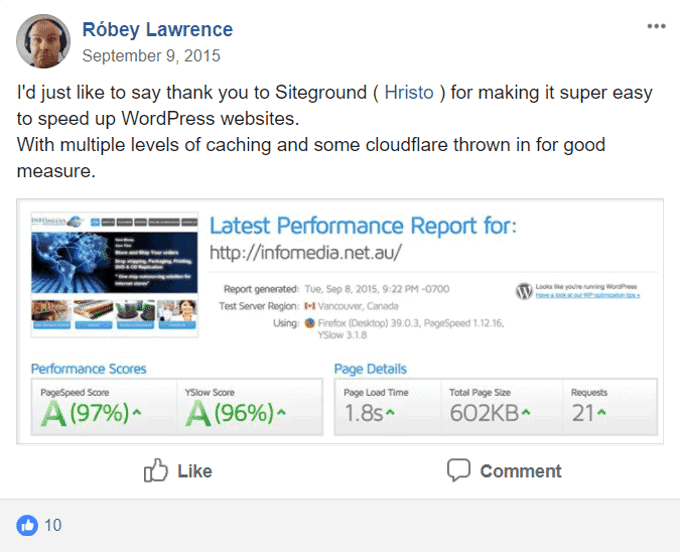 I’d just like to say thank you to Siteground ( Hristo ) for making it super easy to speed up WordPress websites. I’m looking for new a new hosting provider so can you please recommend some reliable hosting for WordPress? Is Siteground really as fast as some claim it is? I hope you’ve found this Siteground Hosting review helpful. I tried to make it as unbiased as possible by using my own experience and feedback/advice on social media. If you have any questions at all please leave a comment down below and I’ll respond as soon as I can. Also feel free to join the WPLearningLab facebook group, we’d love to see you there! same here!! Transfered all sites to siteground. Just the level of WP security was so worth it. Was so tired of getting hacked. Good choice to move Marc, they’re a great host. I’ve never heard of WPX Hosting, it may be great as well. But I’ve encountered a lot hosts and few rank up there with Siteground.